A question that always comes up every single year is when should I decorate for Christmas. Everyone gets into a fuss and argues about when the correct times is when it’s too late or too early. The best thing I can tell you is that it is your home and you should decorate it whenever and as often as you would like. After all, it’s your home and no one else’s so if certain decorations make you smile, it simply doesn’t matter when you put them up. 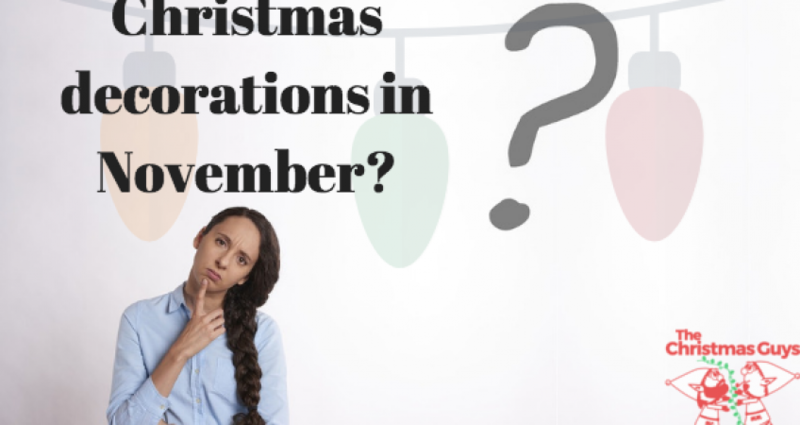 What Month to Decorate for Christmas? Ok now that we have that cleared up most traditions are to light up your home for the holidays on Thanksgiving eve, black Friday, or December 1st. Black Friday is the official start of the “Christmas season” with all the amazing deals and family and friends still in town after sharing an amazing Thanksgiving meal together. So only because we are asked so often here are some responses of the various times I decorate. I try to decorate my own home as well as some of my families and friends homes in late October, simply from how busy I am once November rolls around. I do not, however, turn the lights on and if any larger yard art displays like LED Christmas Motifs I do not put them out at this time, mainly just the lights which are super hard to see when they are not actually lit. We normally begin decorating for clients starting November 1st. Some of our clients turn them on right away because they absolutely love seeing there home lit with Christmas lights, while others wait. After we decorate and test all of the lights and decorations we unplug the main connections to the home and that way our decorating clients can plug them in and have them start to come on and off on whatever day they would like. For any live garland and wreaths, we wait until the week of Thanksgiving typically to make sure all the live greenery remains green through the new year. I decorate my mothers-in-law’s home on Thanksgiving and it’s been a fun tradition. We also decorate all the way through December, typically up to a few days before Christmas. This is typical for new clients that weren’t able to be scheduled prior to Thanksgiving and once we start filling up it is simply first come, first serve. So there is a little overview of when The Christmas Guys suggest starting decorating. We recommend having your lights up when it is the most convenient for you. The weather also needs to be a factor in many parts of the country. The majority of people do not like freezing cold temperatures when trying to hang lights, climb ladders, and decorate the homes. So if you are decorating your home for Christmas by yourself it may work better for you to do it in November before Thanksgiving to get it done and then plug it all in once Thanksgiving comes and goes. In the end, to sum it all up we have learned the “social norm” for Christmas lights and decorations starts on Thanksgiving Eve. Note this article was written when I was requested to answer a question on Quora about decorating for Christmas. You can see the question and answer by clicking here.